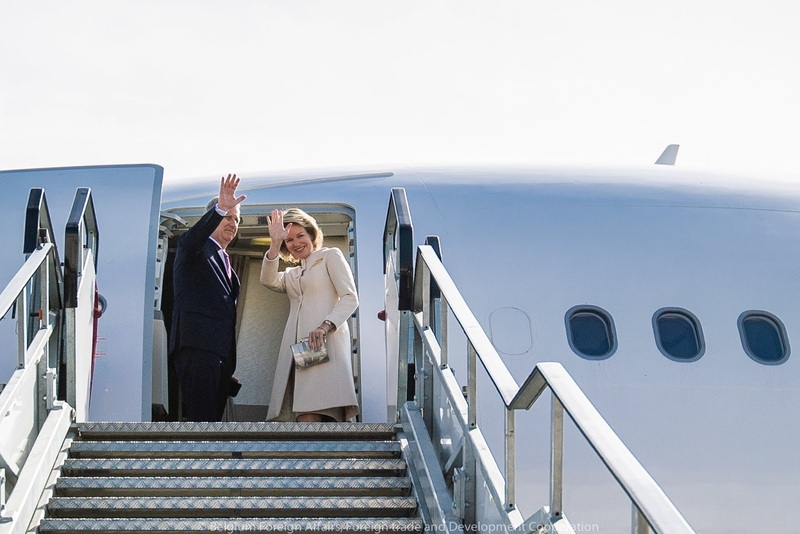 13:20 Departure from Melsbroek airport. 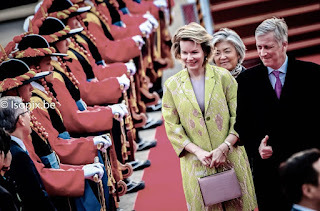 Lady-in-waiting Clotilde Boël and Mathilde's hairdresser Frédéric van Espen. 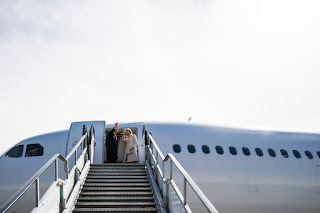 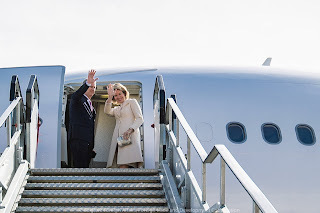 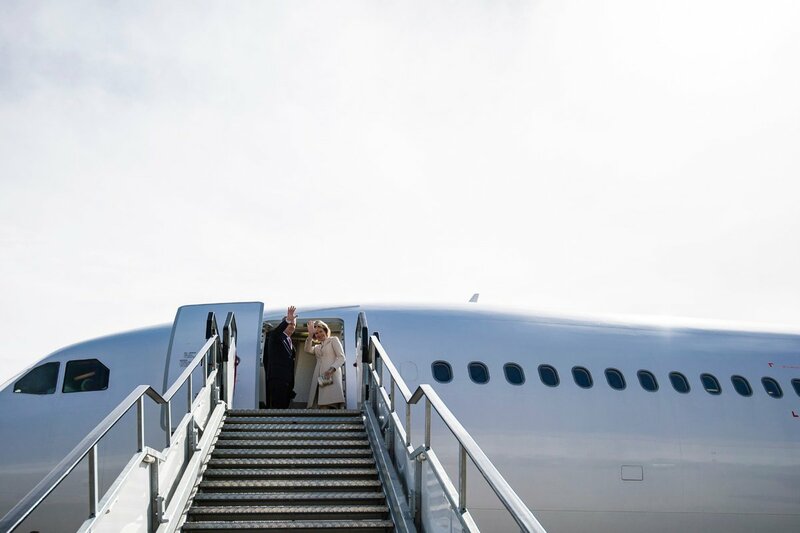 The king & queen were joined by about 200 others on this 4-day visit. 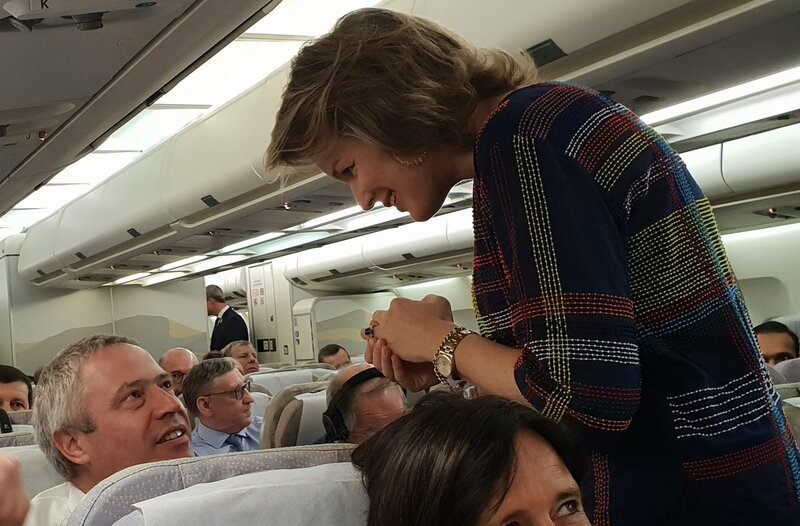 During the flight they went round to talk to the participants. 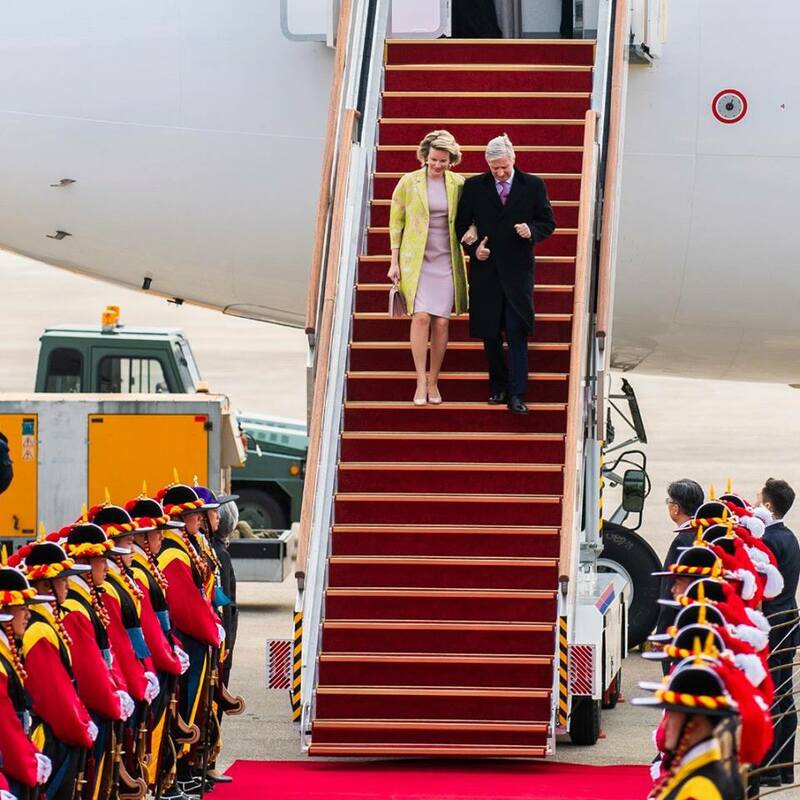 Arrival at Seoul, South Korea. 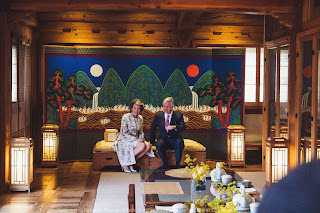 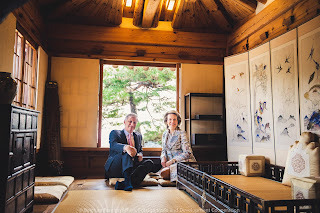 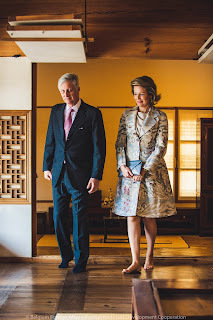 Visit to the Korean Furniture Museum where the royal couple also participated in a tea ceremony. 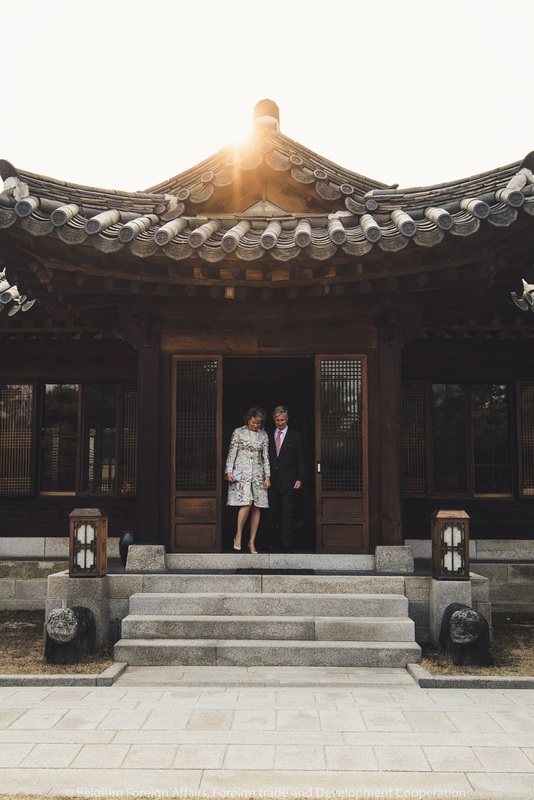 During their stay in Seoul, the king & queen reside at the Grand Hyatt. 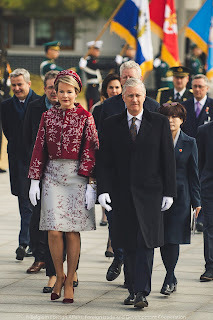 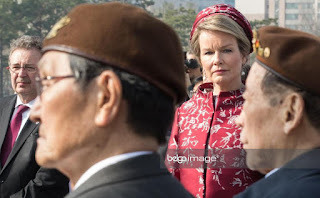 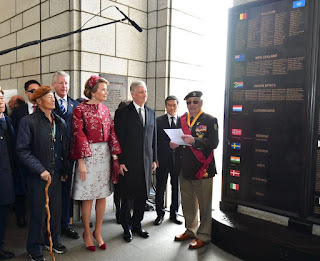 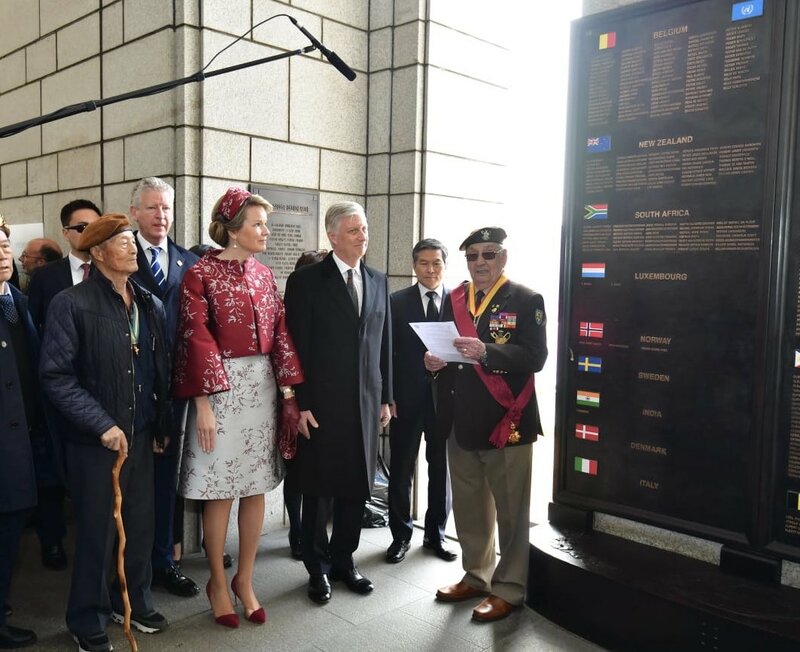 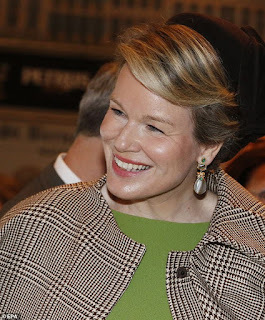 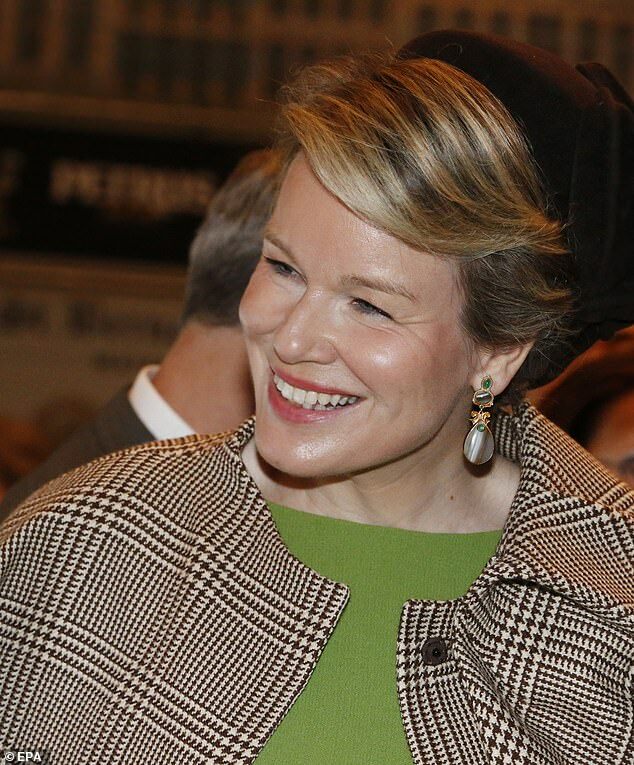 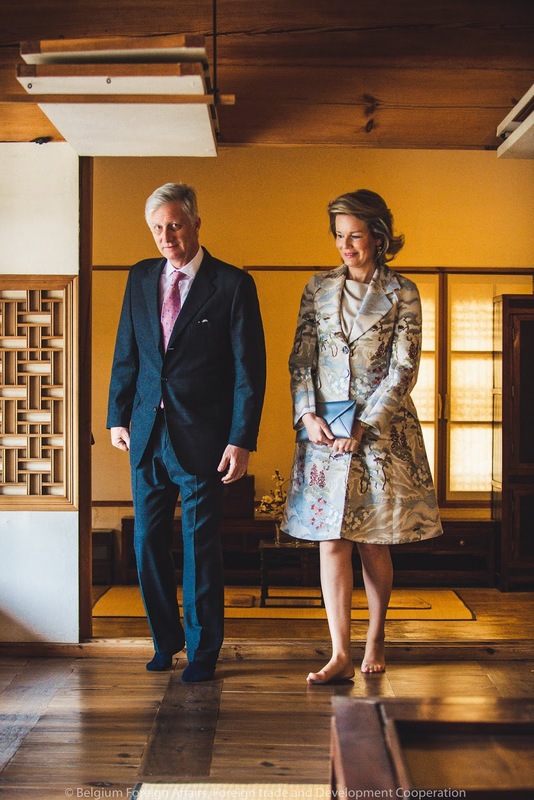 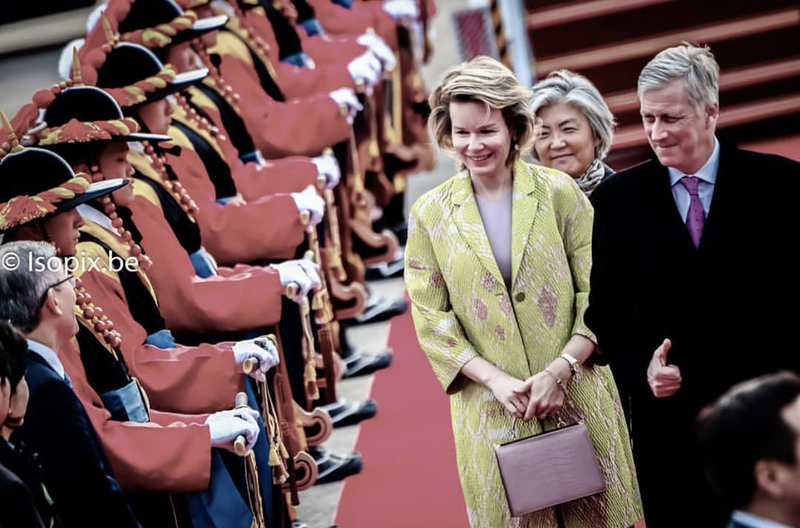 At 8:45 king Philippe, queen Mathilde and Belgian ministers attended a wreath laying ceremony at the National Cemetary. 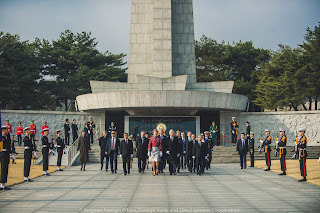 Then followed a commemoration ceremony at the War Memorial of Korea in the presence of veterans. 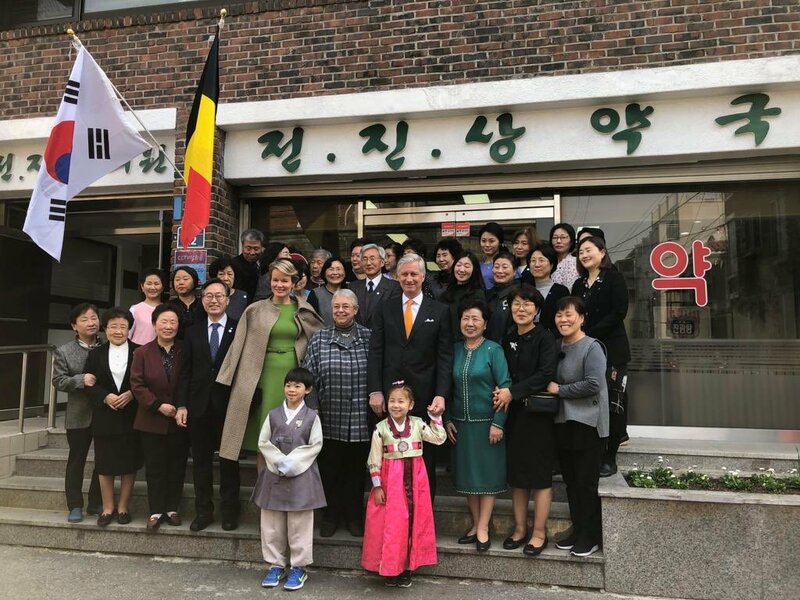 During the Korean War, more than 3,000 Belgian volunteers participated in military operations. 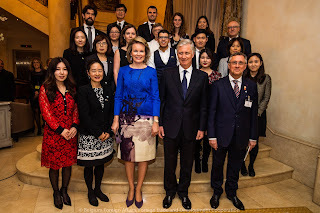 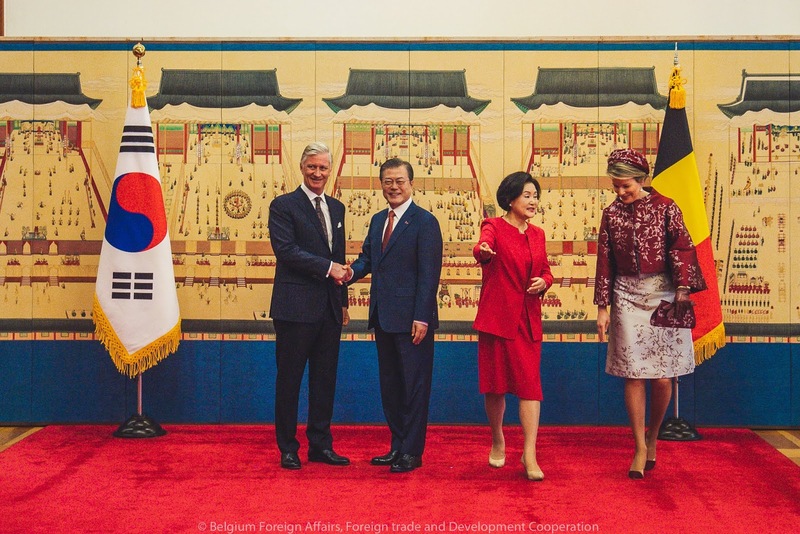 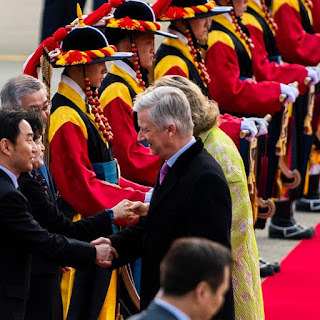 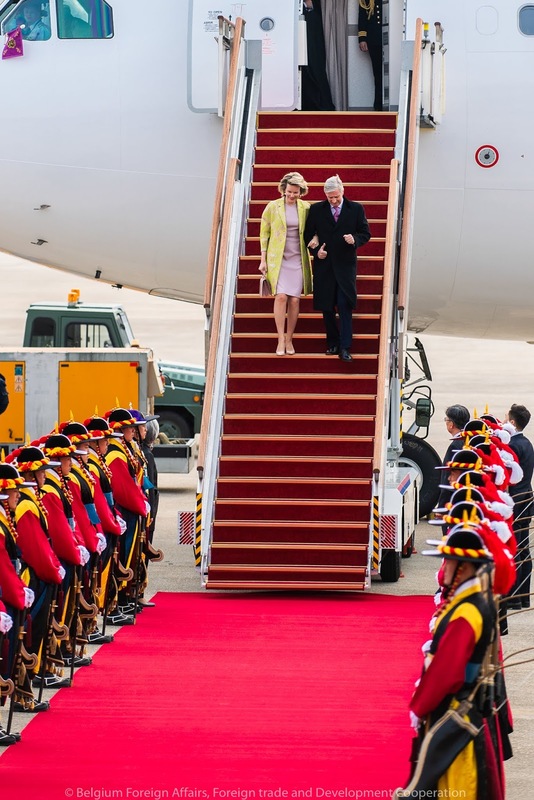 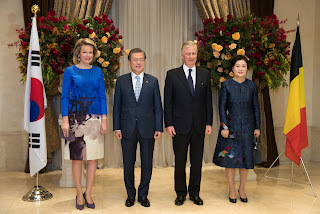 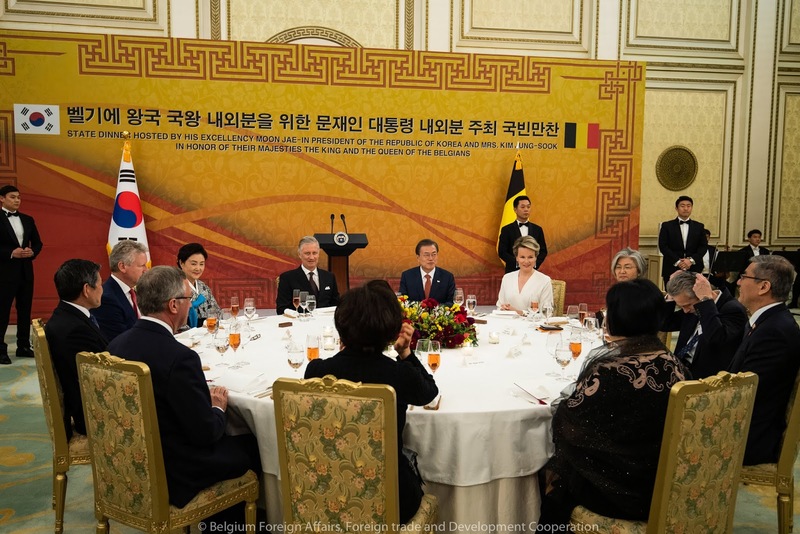 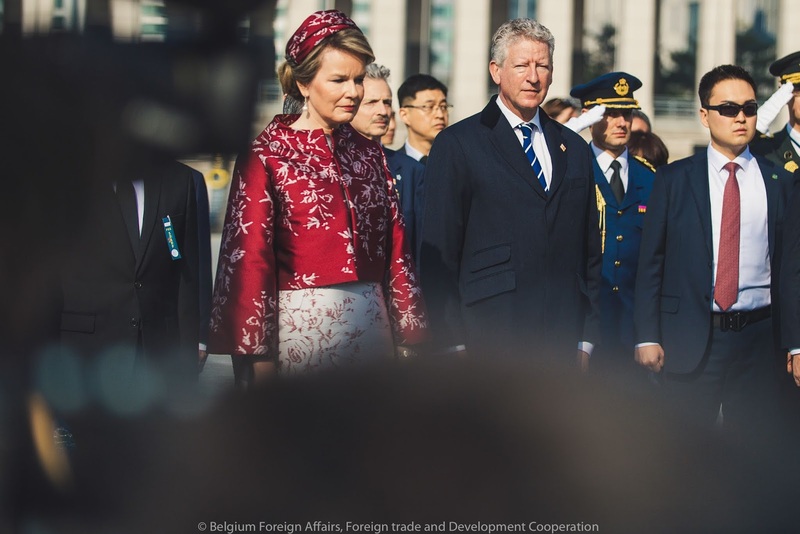 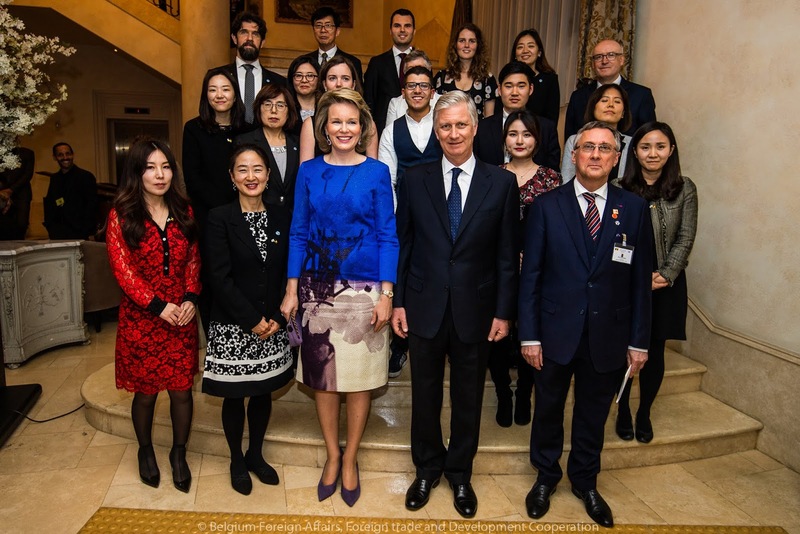 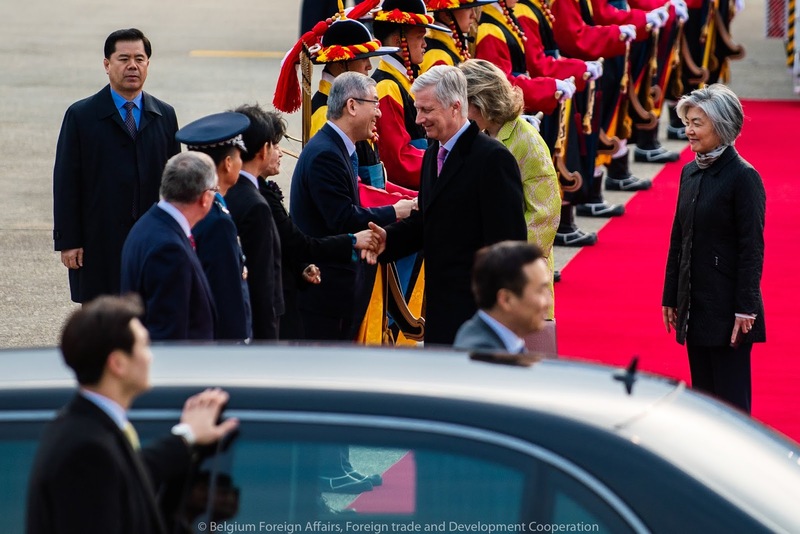 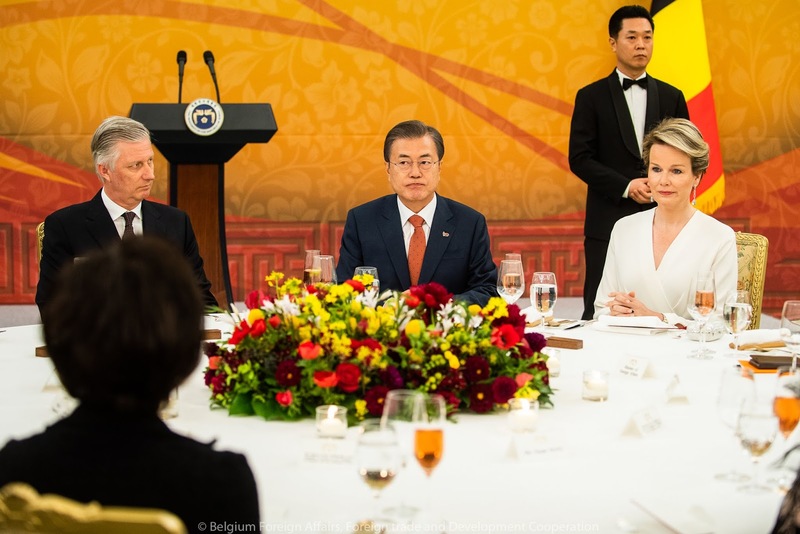 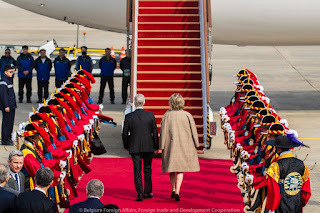 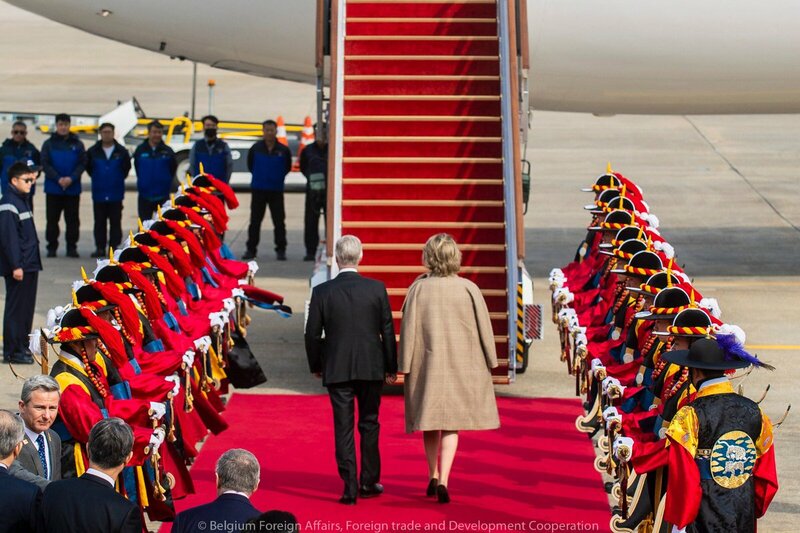 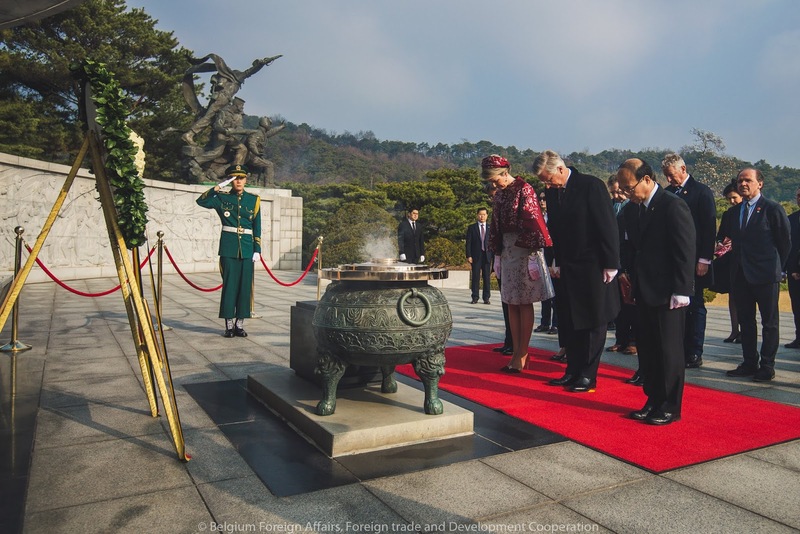 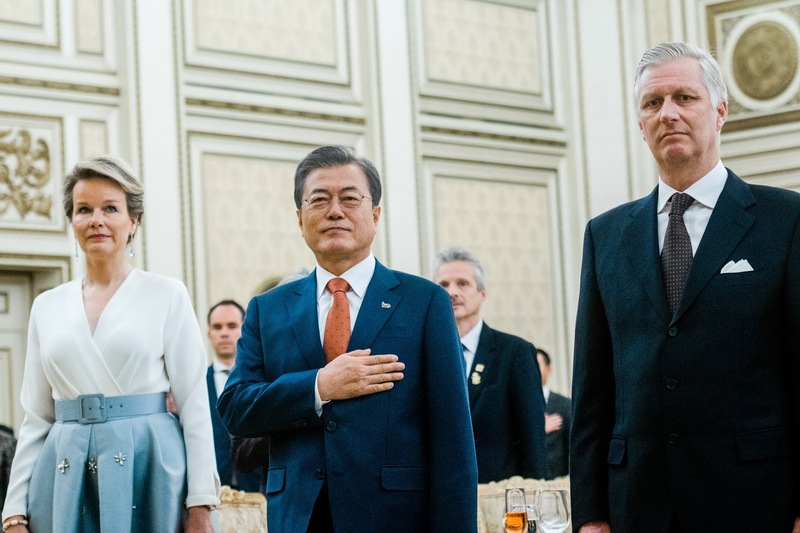 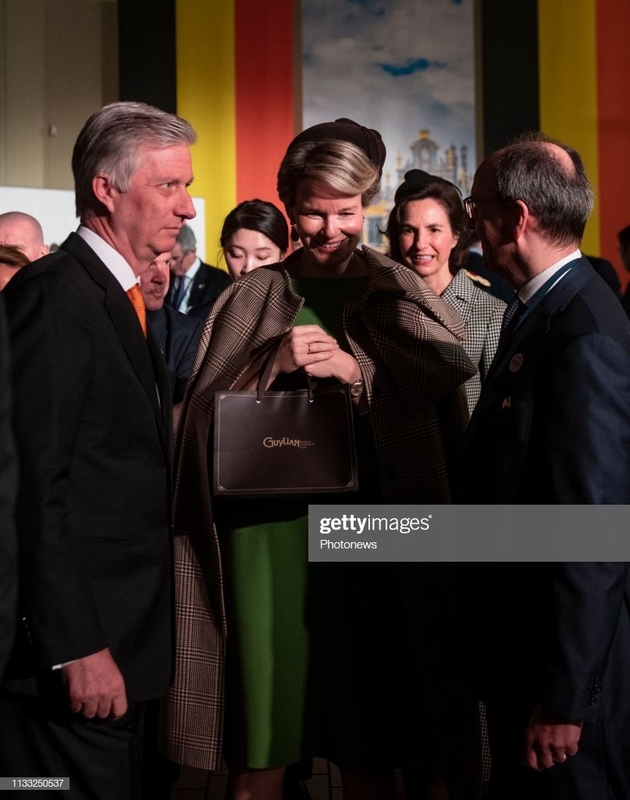 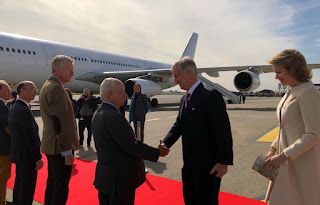 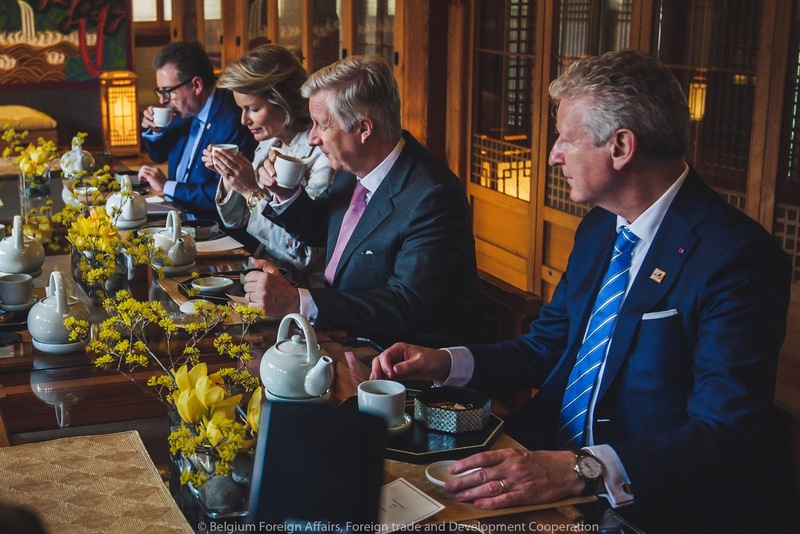 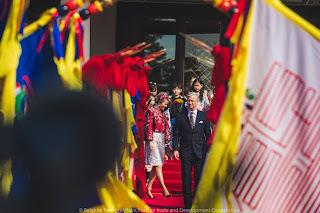 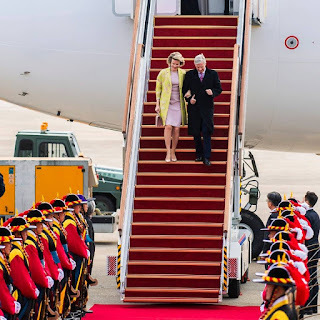 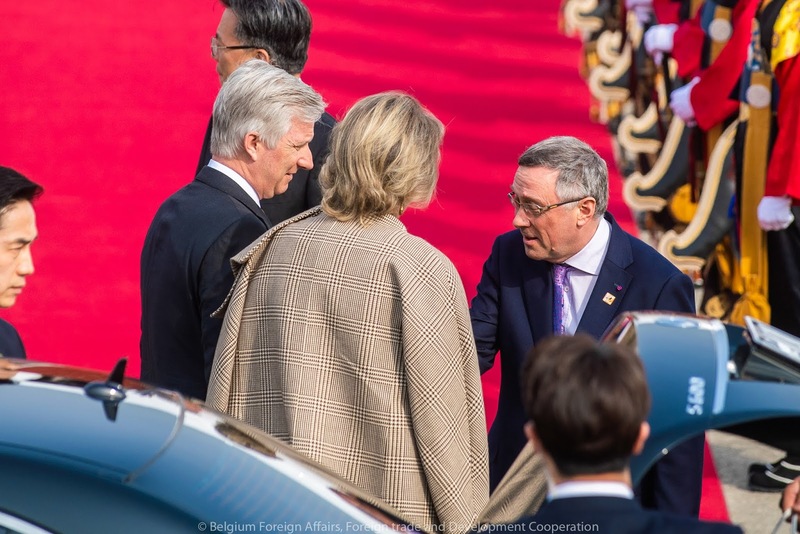 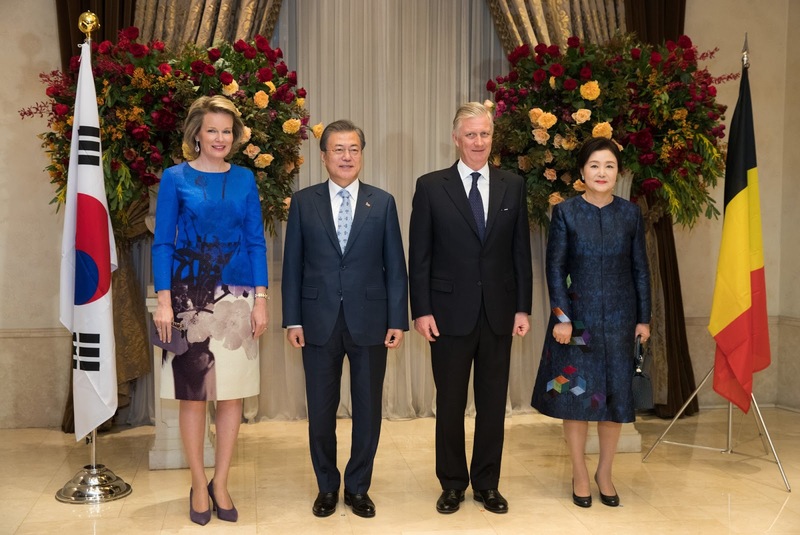 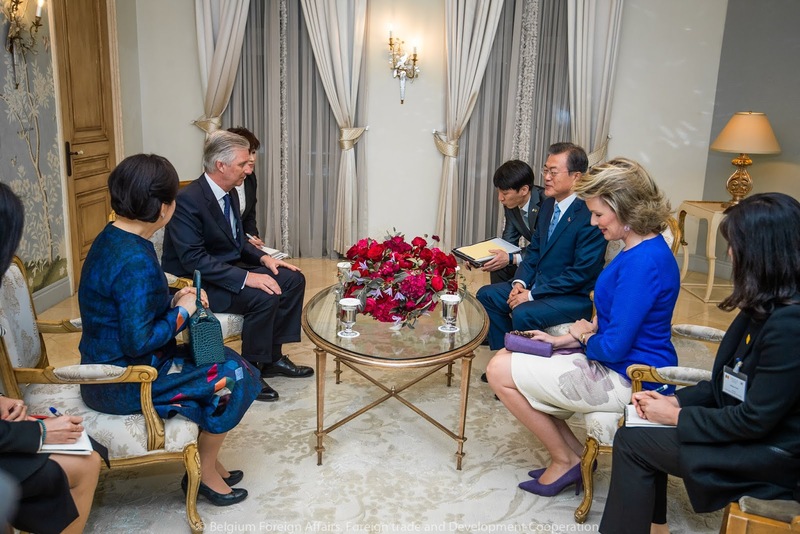 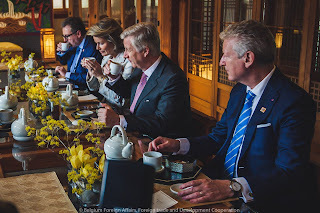 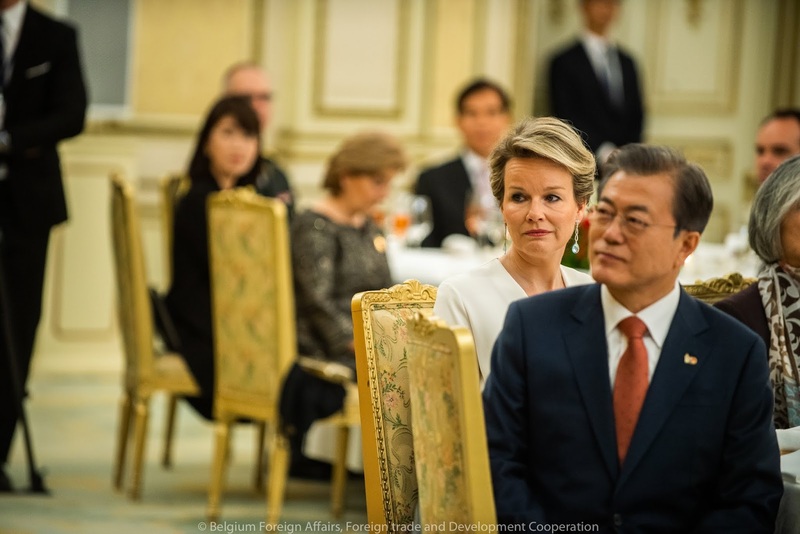 At 10:15 the Belgian prominent guests attended an official welcome ceremony hosted by South Korean president Moon Jae-In. 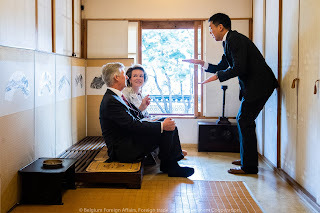 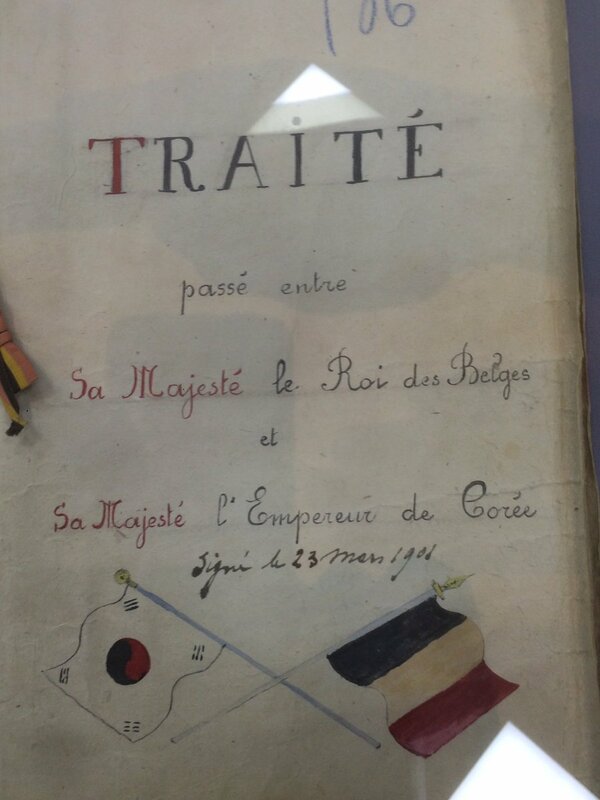 A small exhibition on the relationship between Korea and Belgium. 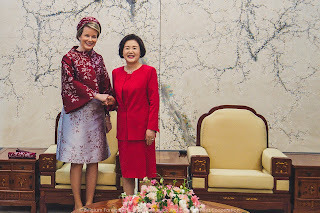 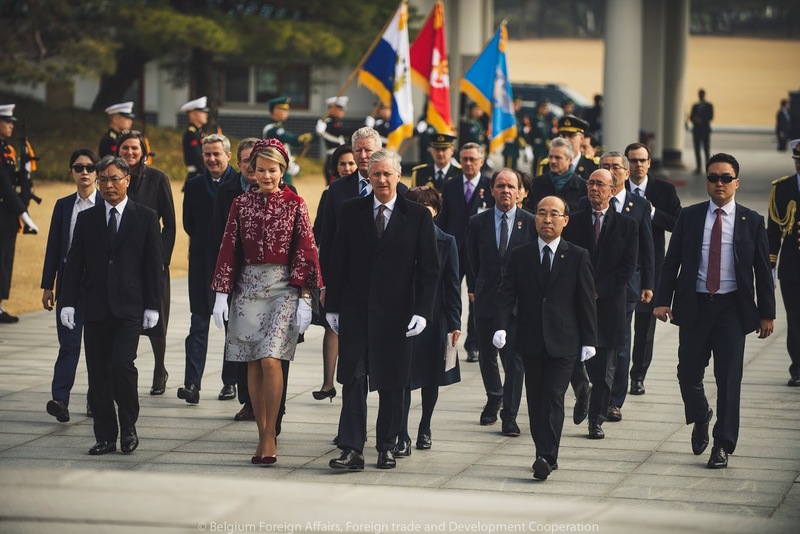 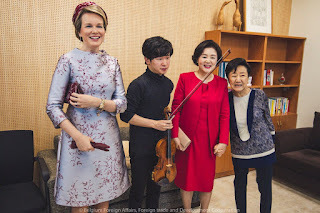 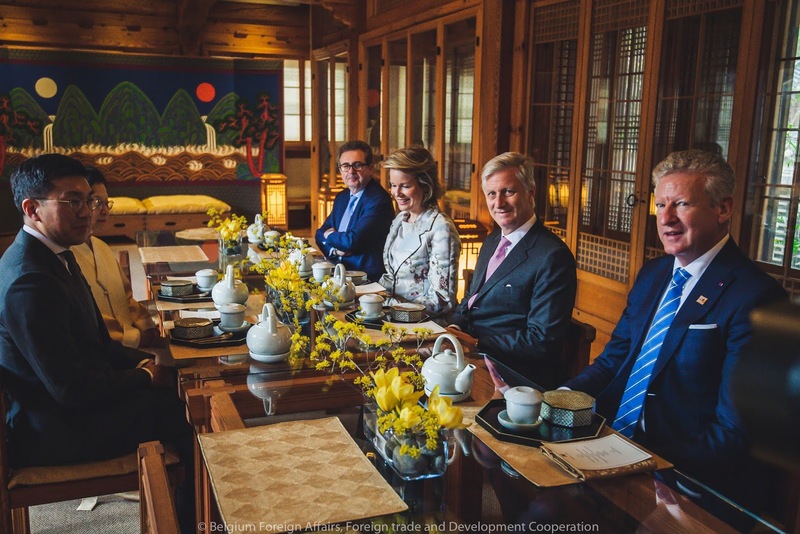 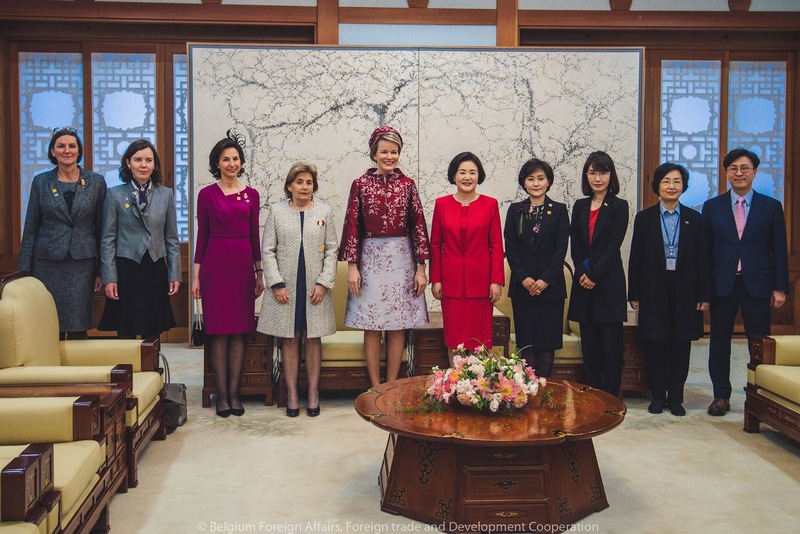 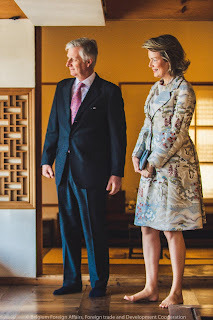 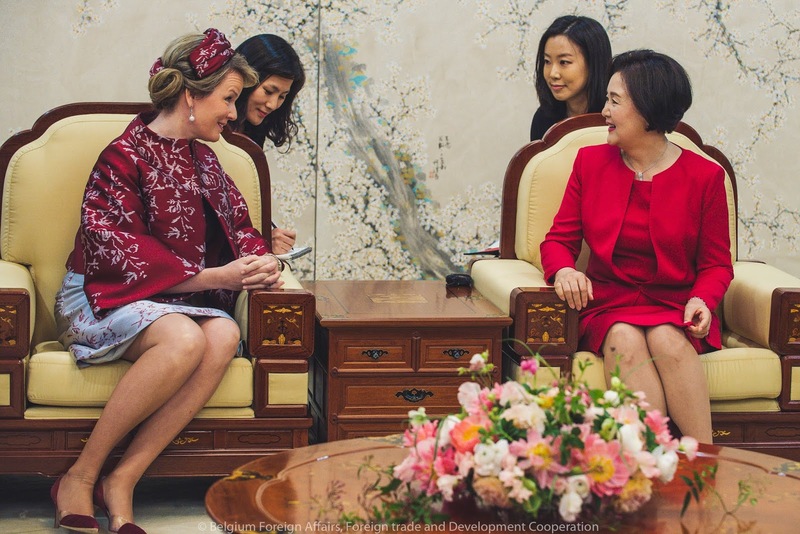 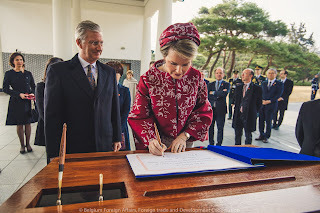 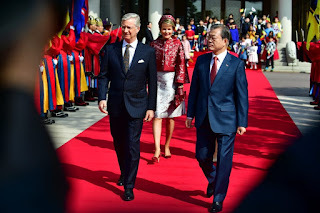 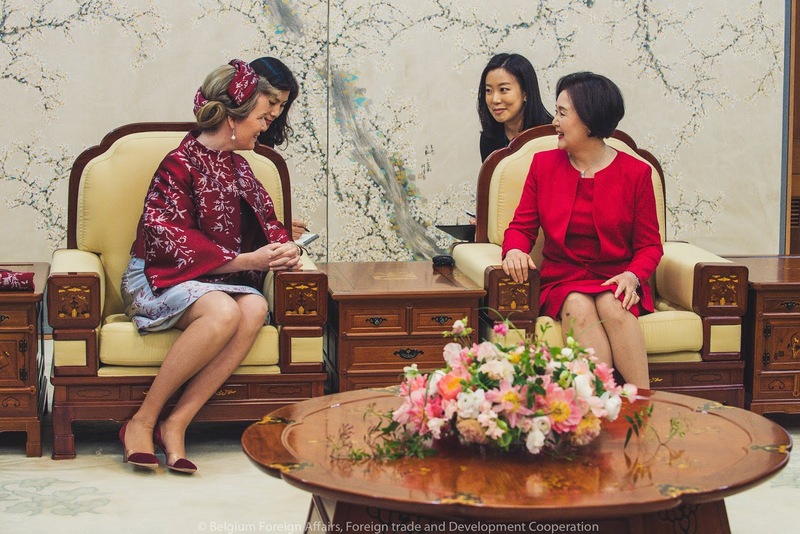 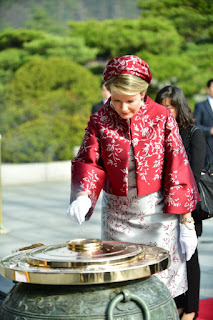 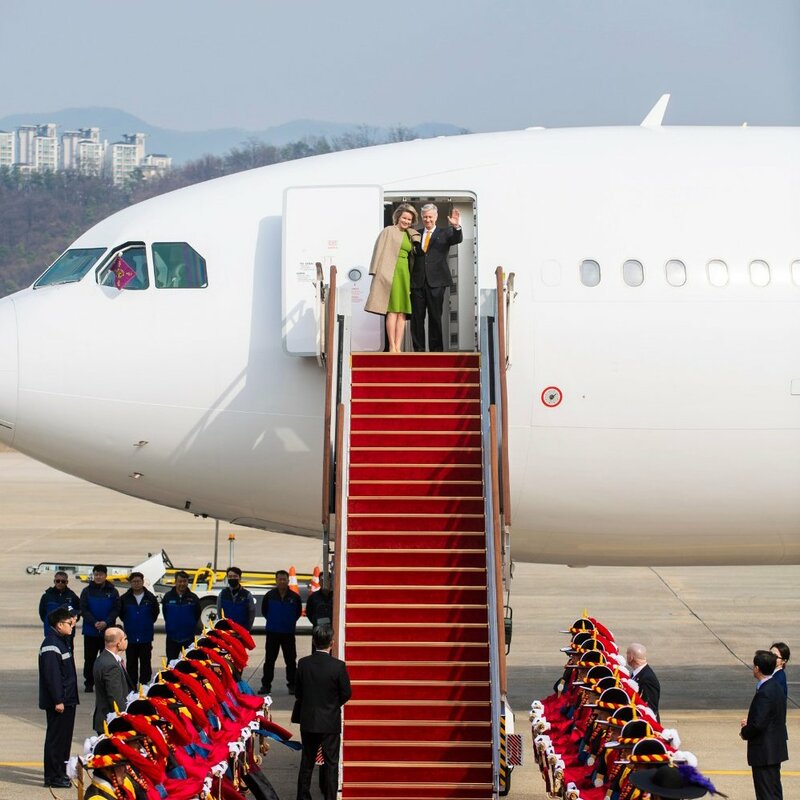 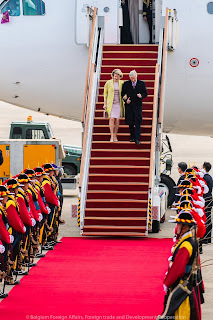 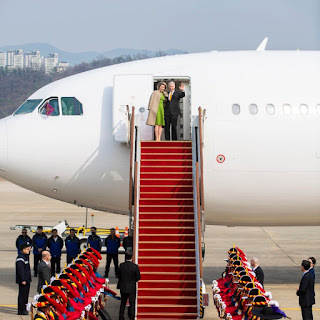 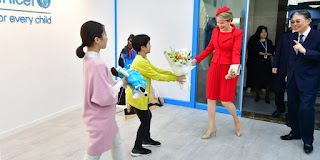 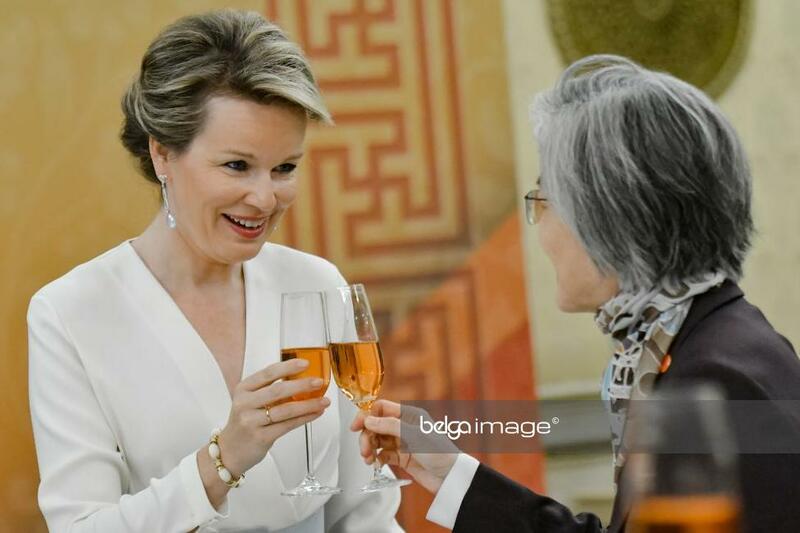 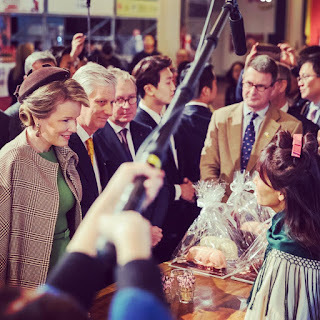 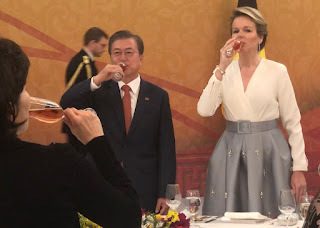 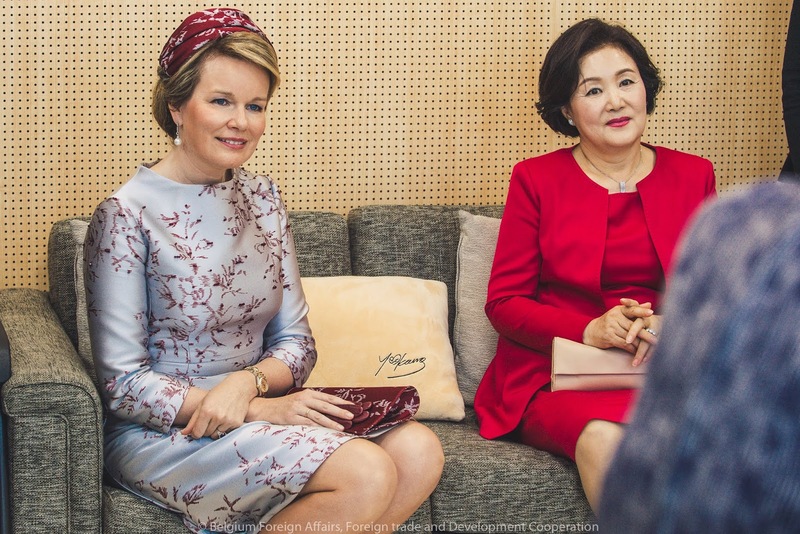 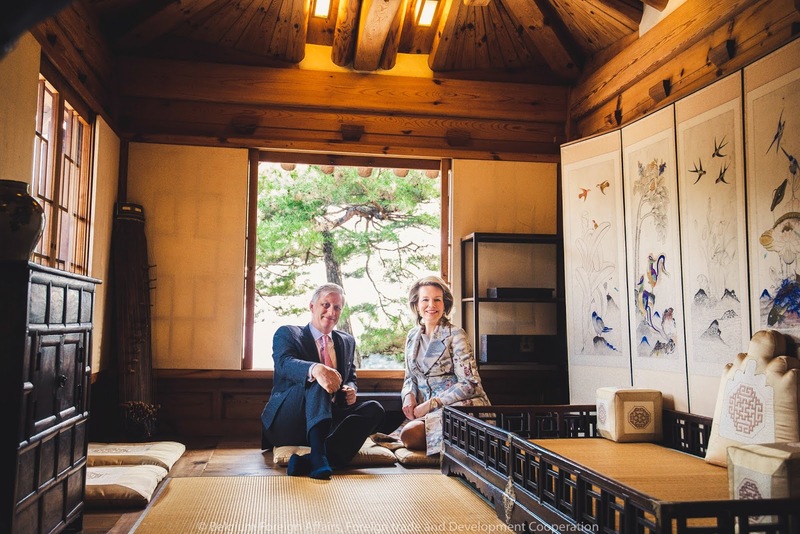 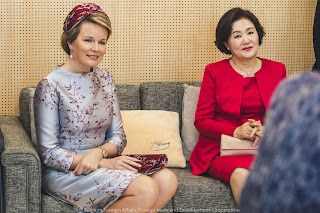 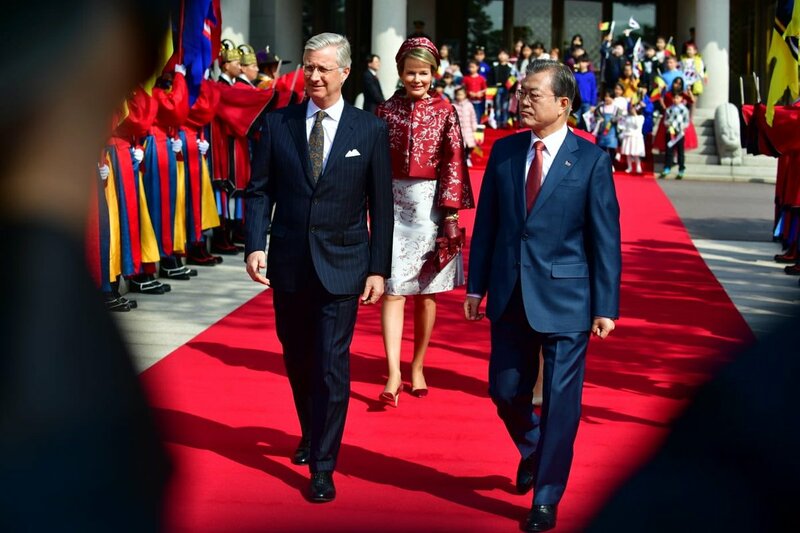 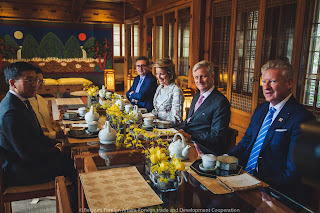 Queen Mathilde and first lady Kim Jung-sook had an official meeting at Cheong Wa Dae (the Blue House). 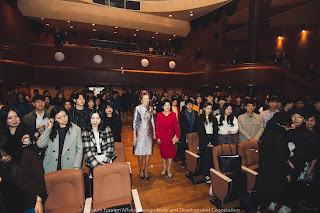 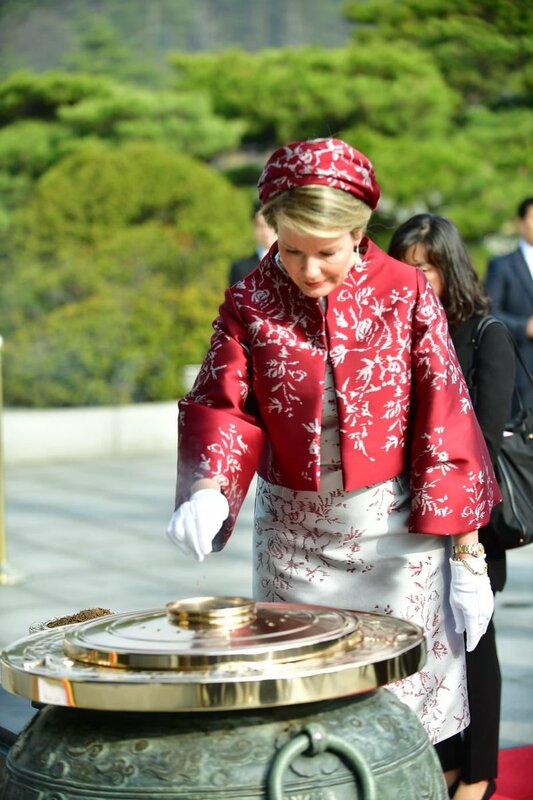 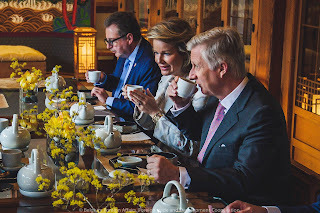 The first lady accompanied Mathilde for a lunch and visit of the Korea National University of Arts – School of Music. 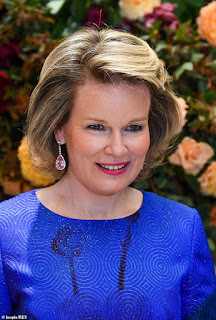 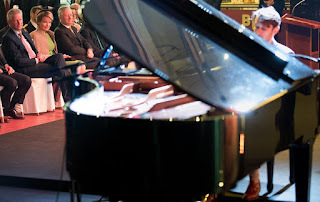 Mathilde is the honorary president the Queen Elisabeth Music Competition. Each year excellent Korean musicians make it to the finals. 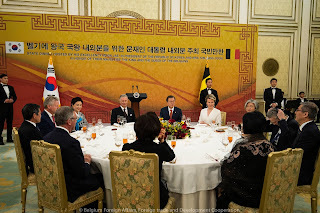 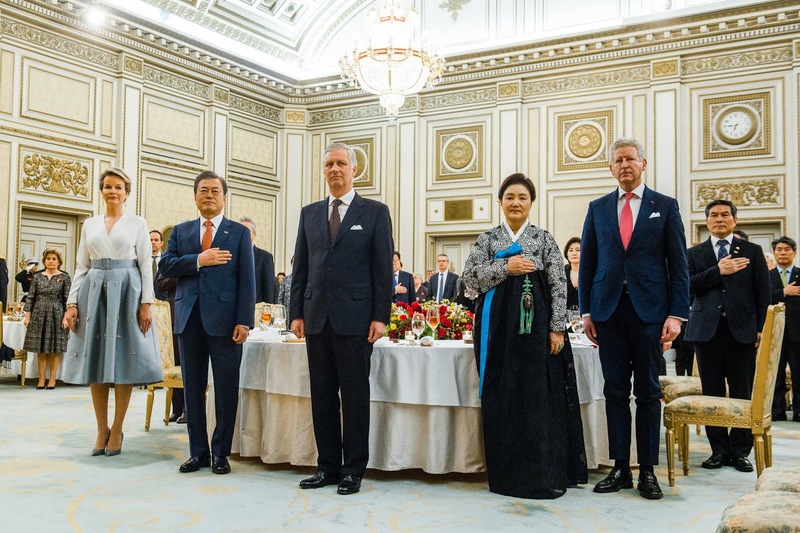 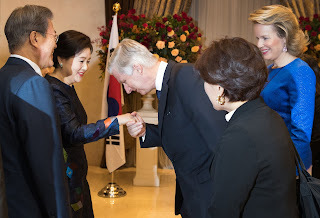 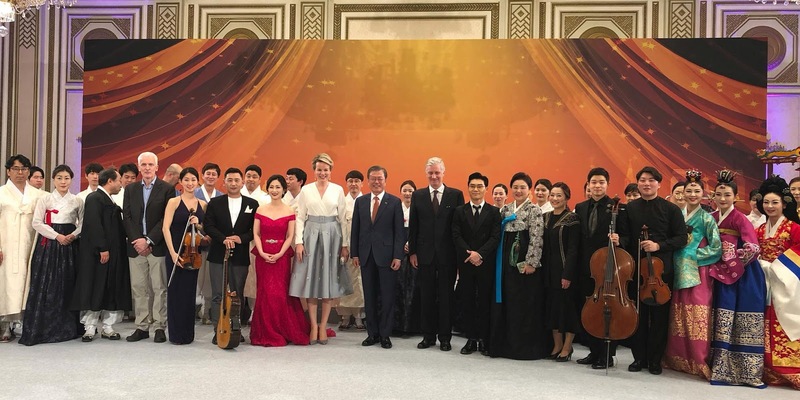 At 18:30 it was time for the state banquet, followed by Korean music and dance. 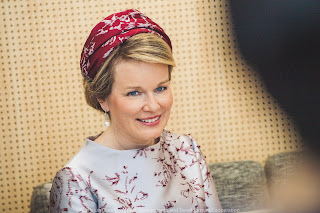 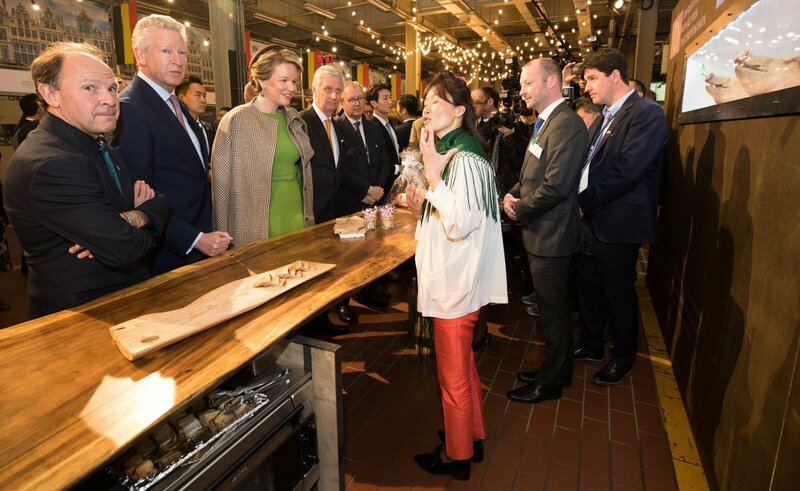 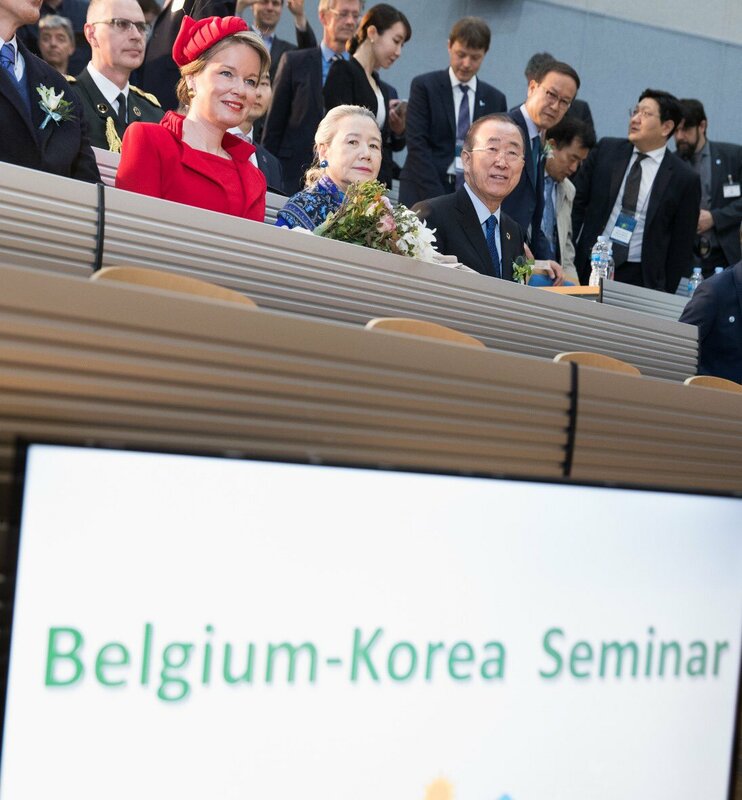 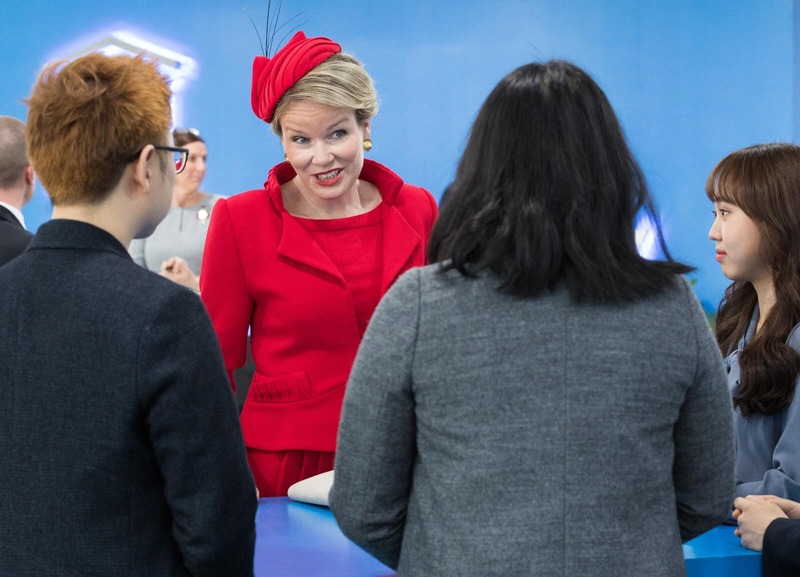 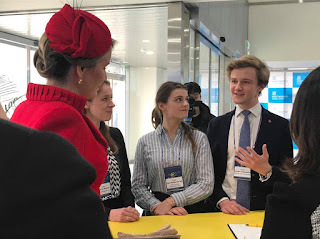 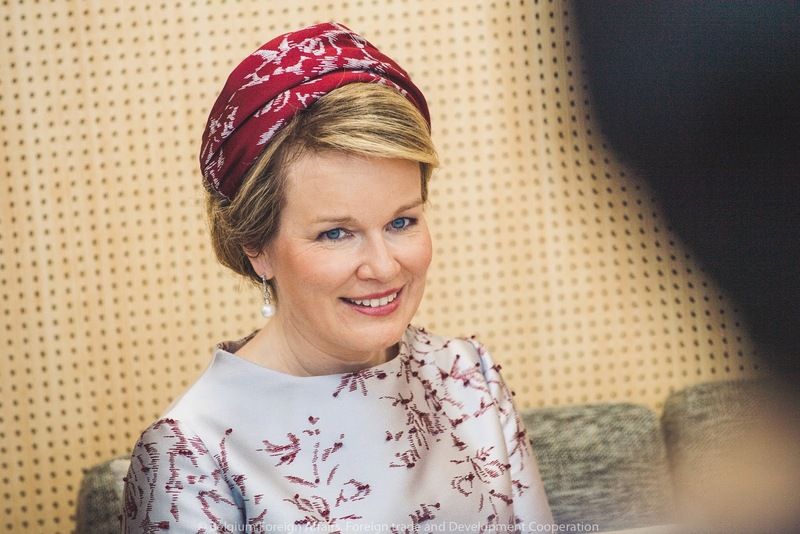 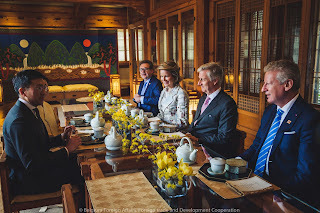 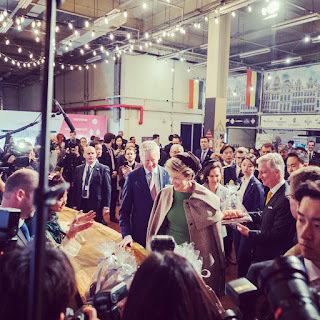 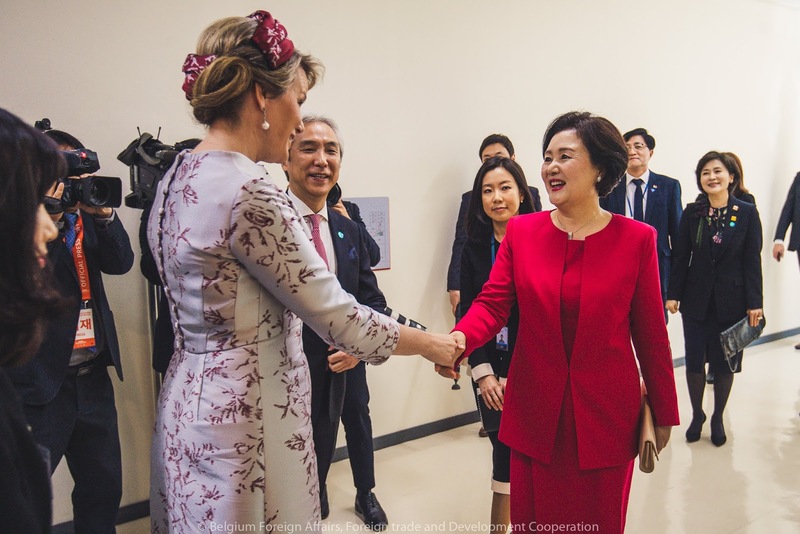 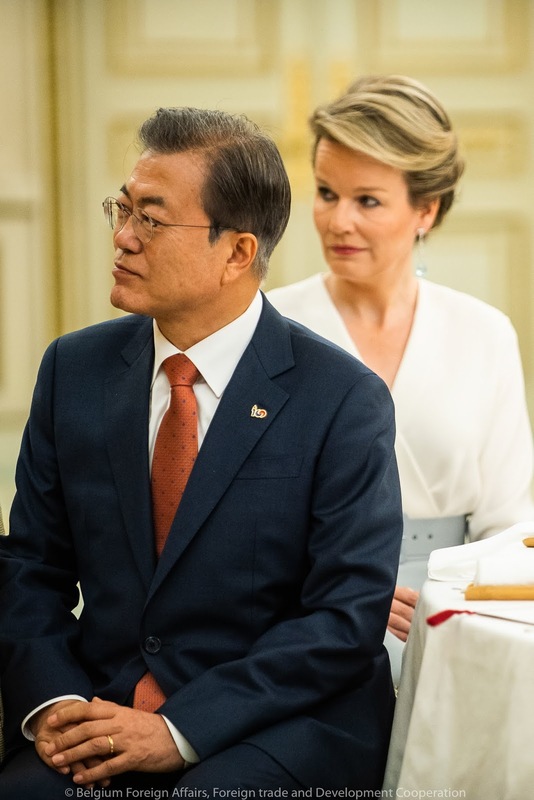 Queen Mathilde had a private meeting with Ban Ki-moon about sustainable development and SDGs at the opening of a seminar on ‘Innovative solutions for circular economy, sustainable mobility and climate change’ at Ugent's Global Campus Songdo. 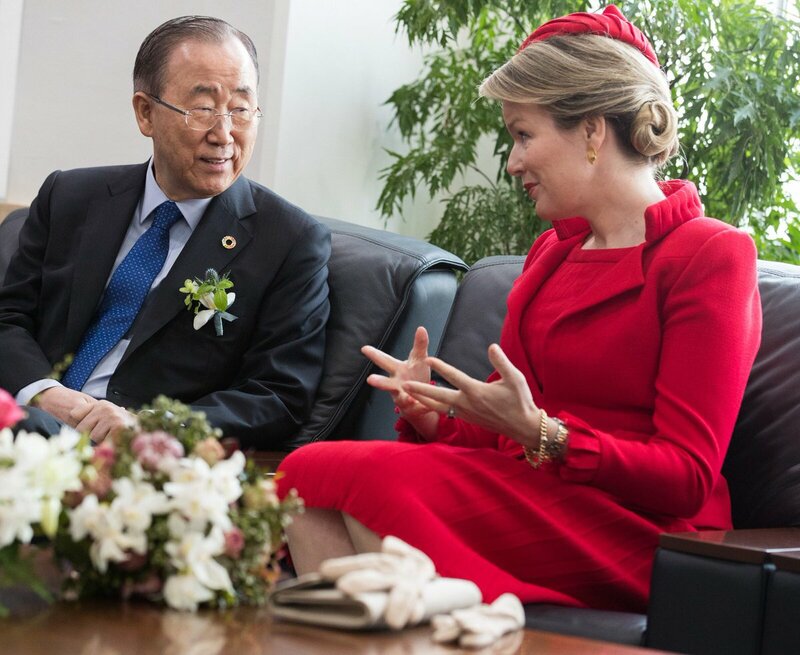 It was Ban Ki-moon who asked Mathilde to become an SDG advocate. 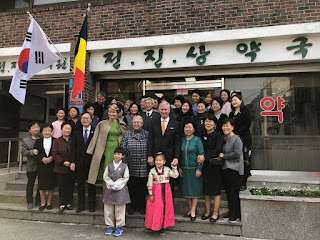 There was a meet & greet for Belgian exchange students studying in Korea. With UGent rector, Rik Van de Walle. 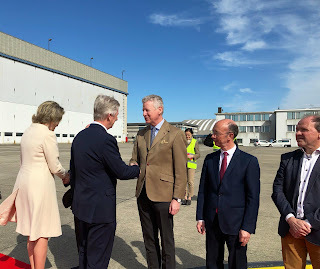 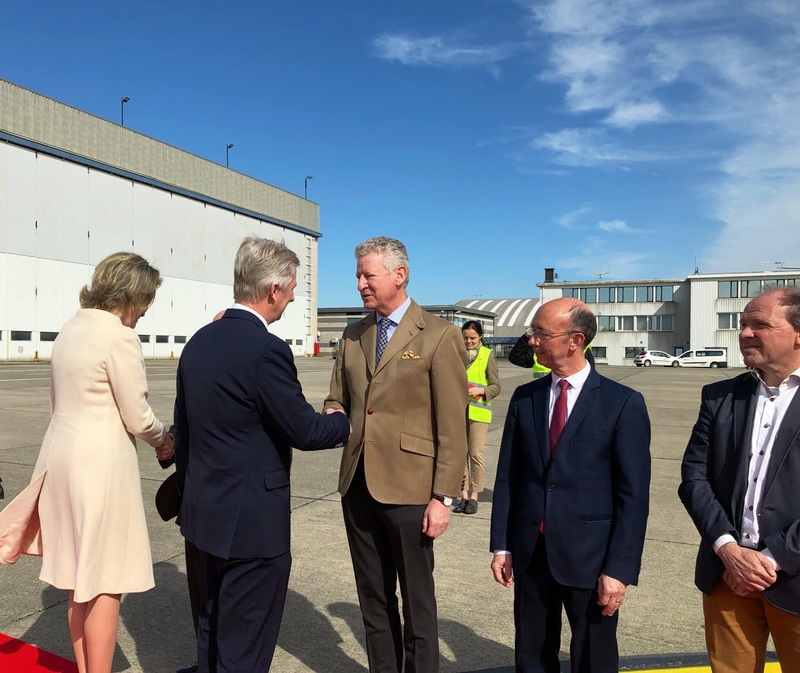 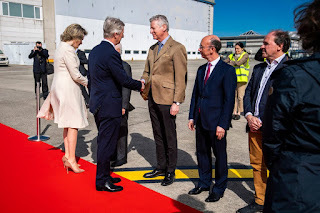 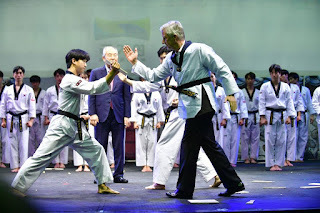 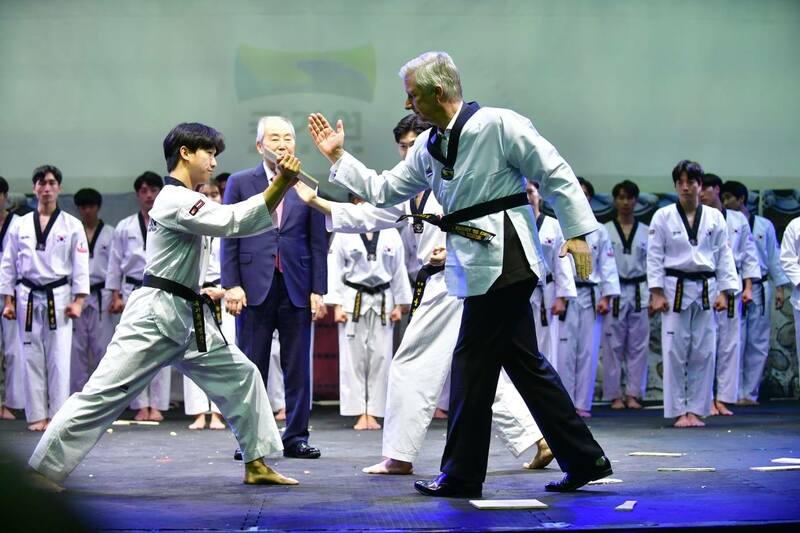 Meanwhile at a taekwondo demonstration, king Philippe revealed that his son prince Gabriel (15) practices this sport. 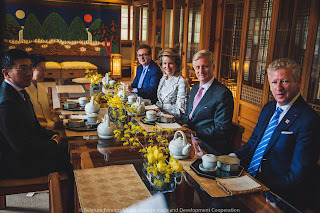 Mathilde had a work lunch centered on climate and sustainability. 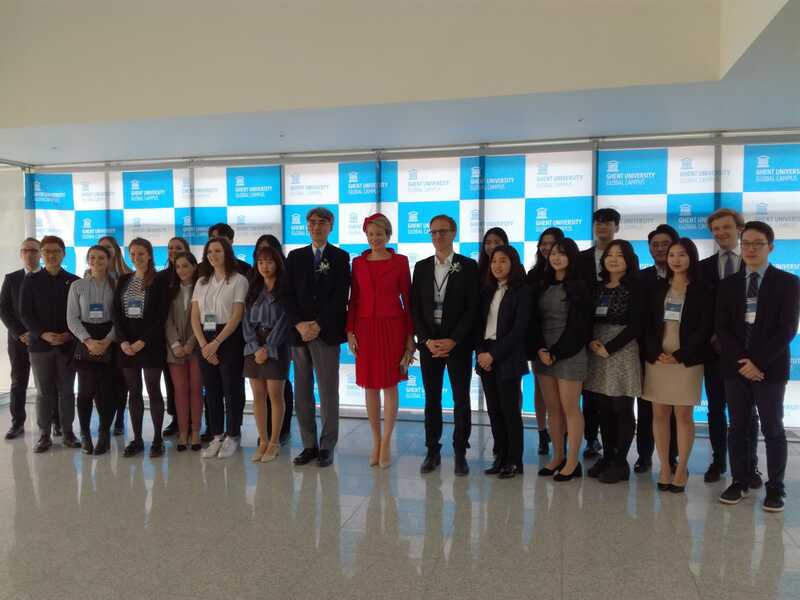 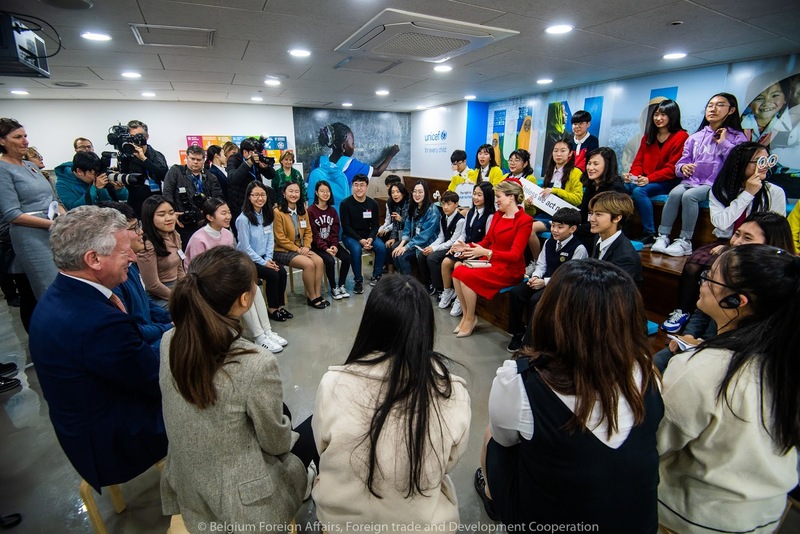 In the afternoon the queen visited UNICEF Korea for a conversation with the Korean youth on climate change & how they can contribute to a sustainable future. 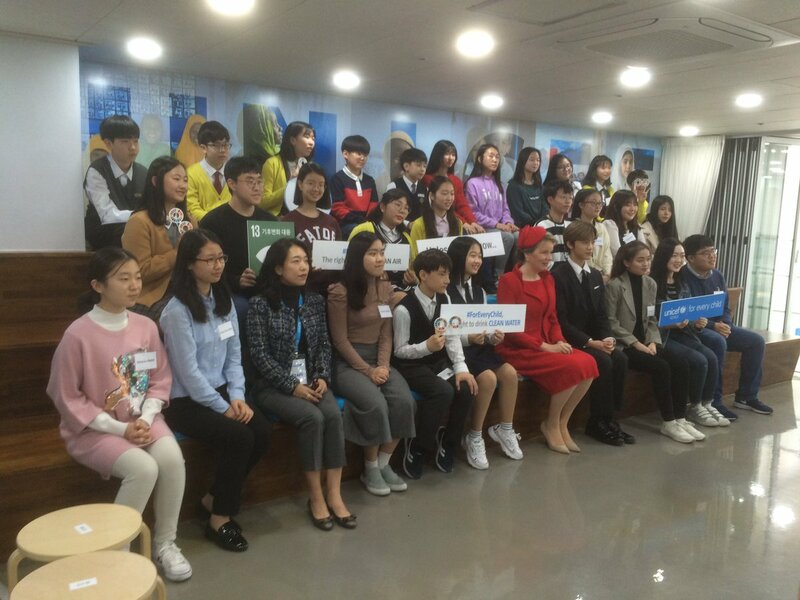 They discussed air pollution, children’s health & the importance of education so “No-one is left behind”. 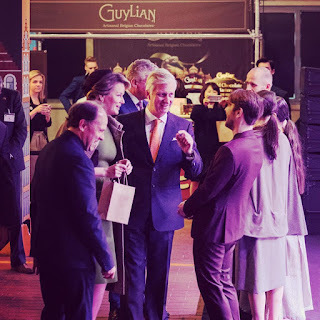 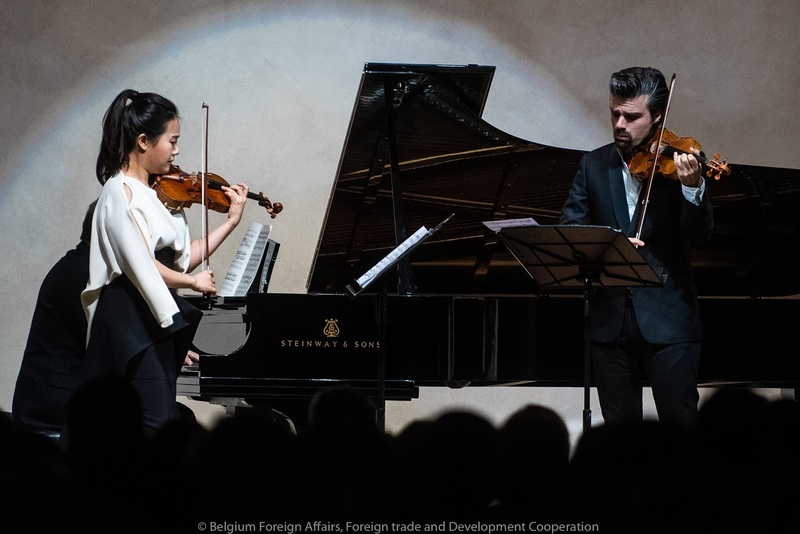 At 18:00 the Belgian delegation hosted a concert by laureates of the Queen Elisabeth Competition, followed by a networking reception. 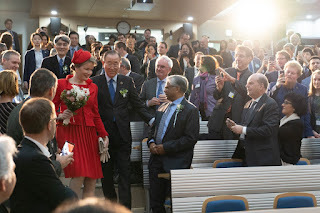 The last day of this state visit started with a private visit to the Jeon Jin Sang Medical Center. The clinic was founded by Belgian Dr. Marie-Hélène Brasseur in 1975 and provides medical and palliative care for the local population. 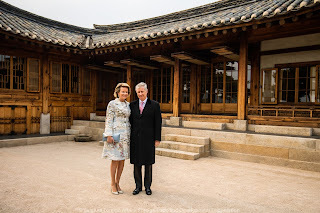 Mathilde also visited doctor Brasseur on her previous visit to South Korea, in 2000, as you can see here. At 11:00 the king and queen officially opened the Belgian Life Festival where Belgian band Sioen performed. The band had a big hit in South Korea recently when one of their songs was used in a Korean commercial. 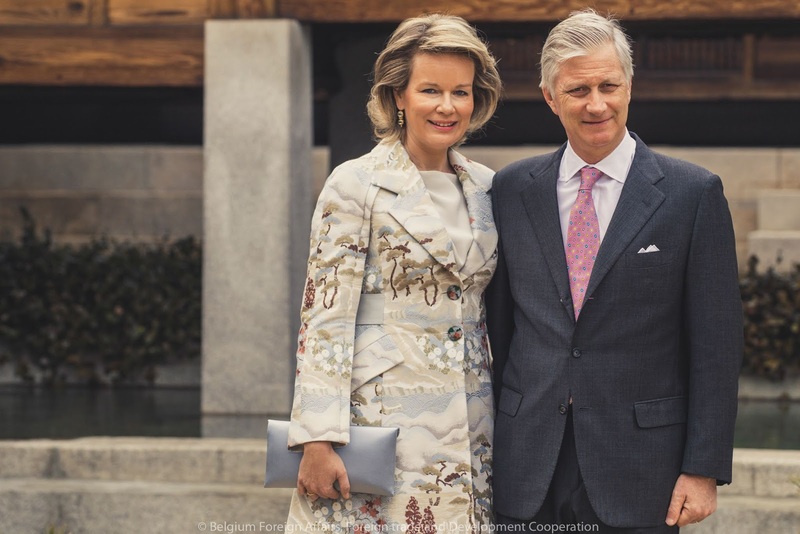 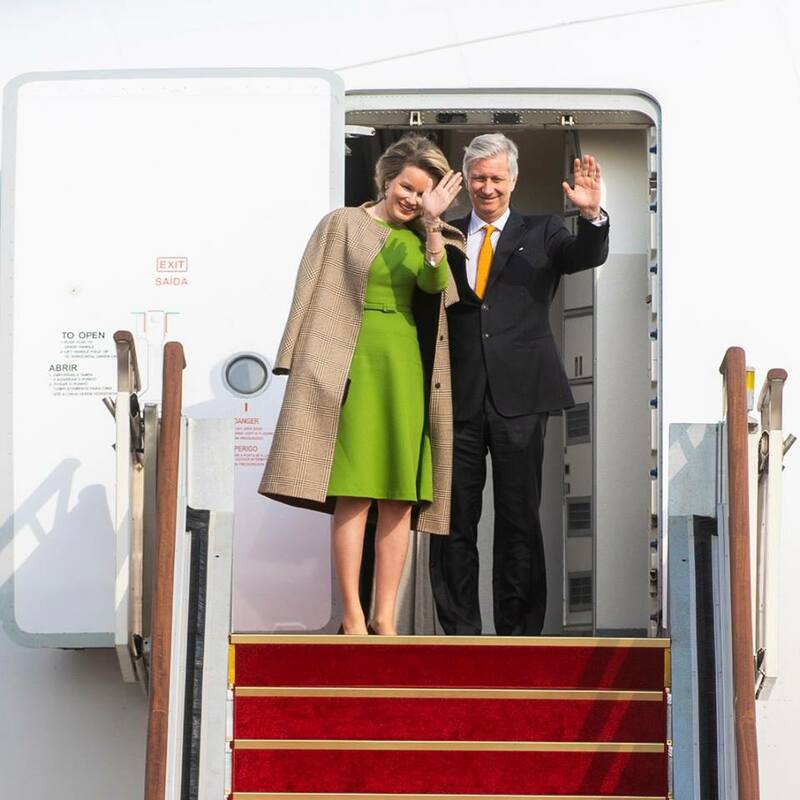 Philippe & Mathilde also had an informal meeting with the Belgian press. 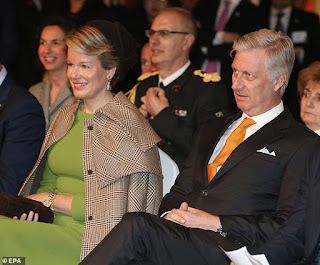 Philippe told journalists that his son Gabriel had practiced a bit of taekwondo with him, so dad woudn't be completely umprepared. 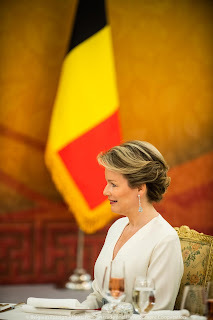 Mathilde sais to be impatient to be with the children again, especially since both her sons were starting exams at school. 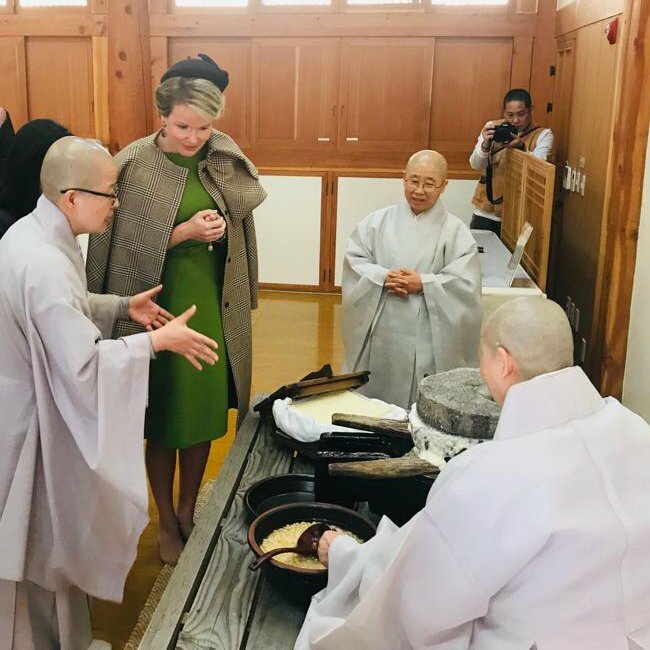 At noon Mathilde assisted at a work lunch on mental health, at the Jingwansa Buddhist temple. 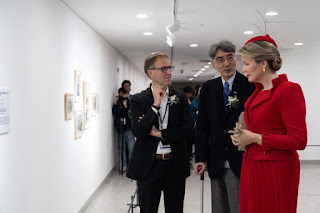 The themes were work-life balance and the importance of culture and art for mental well being. 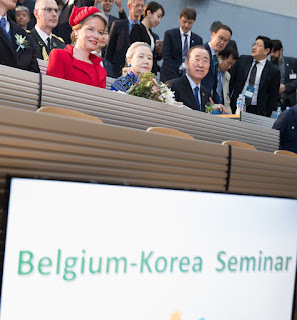 After this final activity the delegation left South Korea in the afternoon to return to Belgium. 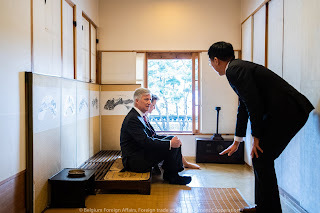 With Belgian ambassador to Korea, Peter Lescouhier.